This season we’re going to hone in on some impressive auctions from the last 60 days -- some rarer than others but all impressive in their own right. Before we get into the auctions themselves, I felt it was appropriate to take a moment and address where prices are in the hobby today and over the last year. A lot of collectors are very bullish on the market, feeling that the movie will lead to a new era of high prices and growth in the value of their collections. This feeling is not unwarranted, however I think that all collectors need to take the current trends as just that, current trends. We’re seeing phenomenal peaks in the hobby these days, but the question of sustainability of these prices is something that all collectors should ask themselves given results have been mixed in some cases, especially on eBay leading into the holidays. This year I was able to travel a lot more than in year’s past and was able to attend several events, from Wizard World Comicons, to Star Wars Celebration and even the Cincinnati Toy Show. Every venue has something different to offer, but the one thing that is consistent at them all is die hard collectors. Excitement has been high all year with our brothers and sisters in the hobby, and you see everywhere you go. Along with spirits being high at each event, one other thing is very consistent: a dialogue about how difficult it’s become to find items. Collectors are holding onto more than in the past and it’s leading to a deficit in the amount of high end items available. In a sense the hobby is very healthy, however the scarcity of certain items is leaving some frustrated and driving up the price of items that really aren’t that rare. The core concept of supply and demand is really the underlying reason for a great deal of price appreciation in the hobby. Supply is at an all-time low, thus demand is at an all-time high. Sprinkle in the excitement of a new movie and a ton of media coverage in the hobby and you have the perfect storm. Thus, as we enter an era of a great new movie, an era of new blood in the hobby and an era of a new peaks in pricing, if one thing is certain, it’s that it the rare pieces will keep getting tougher to find, and the spirit of competition among collectors will continue to evolve. 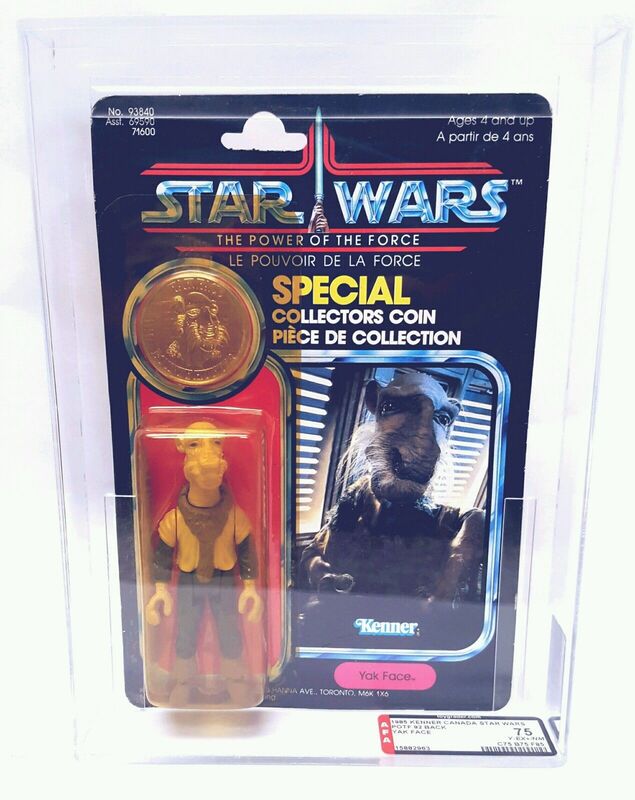 Although many segments of the hobby haven’t kept pace with the prices that we’ve seen in the action figure segment, one that is considered by many to be a “fringe part of the hobby” has kept pace right along the Vintage Kenner toy line are the Power of the Force coins. The segment that is considered by many to be one of the most frustrating areas to collect in has seen incredible prices over the last year. 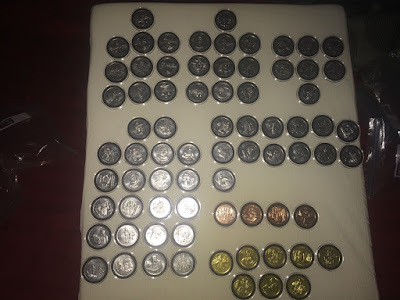 The core goal of many is to complete the 62 coin set, and from what I’ve seen and heard this quest has one of the highest abandonment rates of any run in the hobby today. This is mostly due to the fact that the Category 4 and 5 coins represent such a small portion of the overall availability and demand incredibly high prices, with coins like the Sail Skiff seeing prices over $1,500 in the last year. Given this, several collectors have taken the route of buying a complete set and saving themselves the headache of years of time and angst piecing together the run. In our first auction we have someone that has elected to do just that. This 62 piece collection of the POTF coins is most impressive. With an initial listing price of $25K it may have seemed daunting and overpriced, however someone was able to work this individual down to a price of between $13 and $16K. Given where the market has been on individual coins over the last year we can come to the conclusion that if all were available it would cost someone roughly $16-20K to put together a set, a move like would save a lot of time and overall investment into the set itself. When it comes to 12 Backs there are so few pieces that are truly rare by definition. 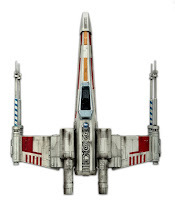 In fact when it comes to MOC figures from Star Wars the first 21 are some of the most common. Double-telescoping lightsaber figures are on one end of the spectrum, and just down the road is this little guy the Vinyl Cape Jawa. Averaging a price 10 times that of most 12 Back figures, he is one of the most difficult to find and by comparison to the others is actually rare vs. just sought after. This Jawa is a great example of just how much prices have appreciated in the past year. Selling consistently for $6 to $8K last year, it’s hard to fathom what impact one year has made on the going price. Our next two figures are staples of rarity and high prices in the hobby. 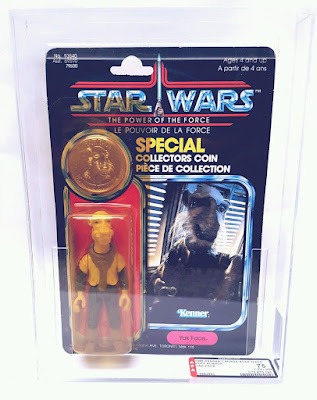 Yak Face and Anakin Skywalker were only released in a few countries on a POTF cardback. 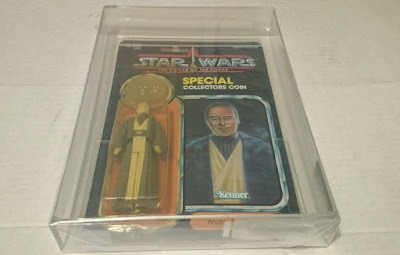 Although a loose Anakin is fairly common given the mail away promotion for the figure, a loose Yak Face can command upwards of $450 these days. Think that’s crazy? Well, just the coins for these figures have gone through the roof in the last year with an Anakin coin commanding $2-300 and a Yak Face coin averaging around $500. Taking into consideration that the loose components are roughly $950 it’s easy to see that a good condition carded example is way up there in terms of price. Both figures support the notion that prices have hit a new peak as these figures have never seen these types of prices in the past. However crazy, they are a few of the rarer figures when you look at the line in totality and coming in with an AFA75 and an AFA…shows that collectors will continue to shell out large wads of money to for something that is in good shape. Growth is at the core of the discussion this month, specially focusing in on price and value growth in the hobby. But it can’t just be measured by dollars and cents. For many long time collectors, growth is about expanding into new territories and new segments of the hobby. In the 2000s pre-production in the form of proof cards was an expanding area, in the last 5-6 years catalog mailers have taken off in popularity, and more recently store displays have gone from a niche to mainstream in our hobby. The array of different store displays out there is pretty impressive. 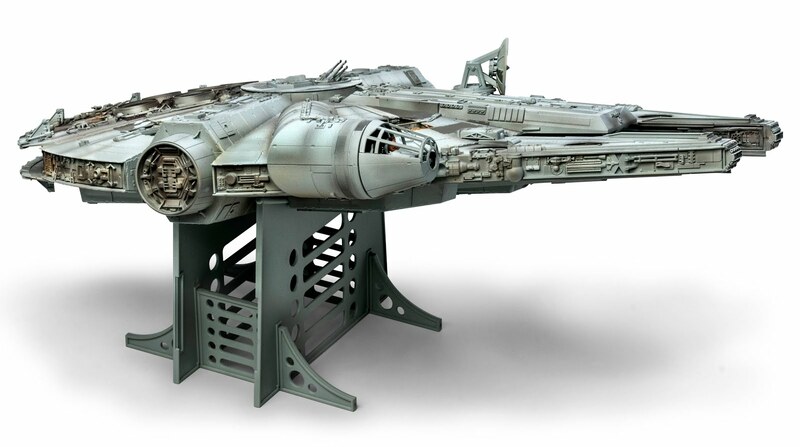 From backers to shelf talkers to hanging displays, there’s plenty to keep collectors busy. Unlike most segments, these items were thrown away more than they were kept, making finding them a fairly interesting task. Regardless the numbers of displays and portions of displays that survived is fairly staggering, however the frequency of their availability on the open market is something completely different. Thus when something comes up it usually commands a high price, and when something ultra rare comes up, the prices go through the roof. Such is the case with the item at hand -- the backer for a bin of figures used in certain mass retail channels. Very few have survived and if you had any interest in getting one, this was a rare chance to jump on it. Our next item is a unique piece unto itself. Display stands were not a very successful segment of the toy line, and by the end of the ESB run these items were taken out of the core toy assortment. 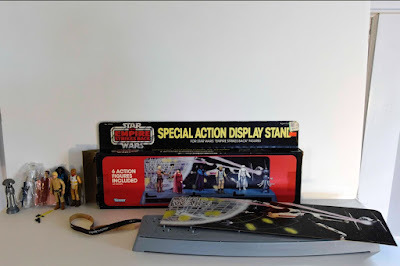 The ESB version of the display stand was Kenner's last attempt to get people to spend a few more dollars on a piece of plastic with a simple backer and sticker package. 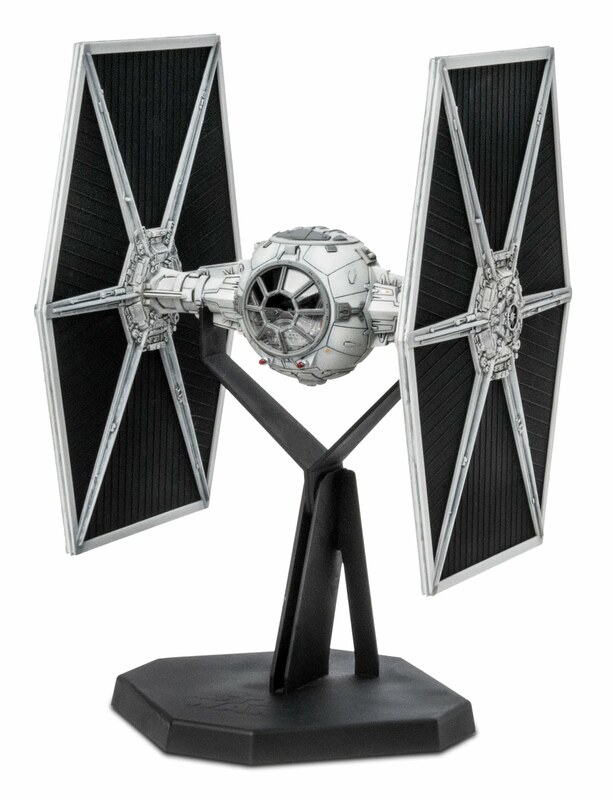 They put all their irons in the fire with this one, bringing 6 figures into the mix, and because of this it's one of the most sought after display stands in the hobby. It's rare, and it has demand, and as anyone can see from the price you need to drop a lot of cash in order to find one. 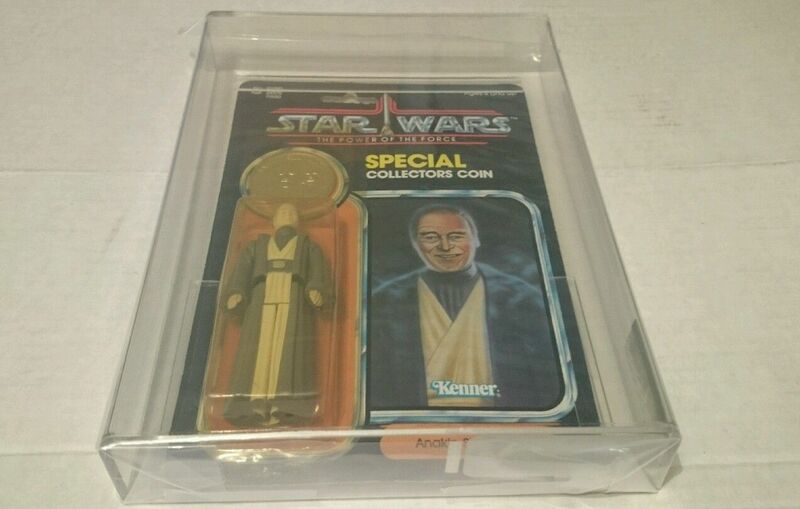 It's a great piece for any collector, but in this case I have to say it went for a lot more then it's worth, given it's open, and all but one figure has been taken out of it's baggie. Nevertheless it's a crazy market and I'm sure someone who needed this was more then willing to dish out the cash to find it. This month we saved what might be considered the best for last. When it comes to things appreciating in price in a hobby there is always a segment that over performs vs. the norm. It’s a function of demand, the thing that differentiates the mundane from the majestic. 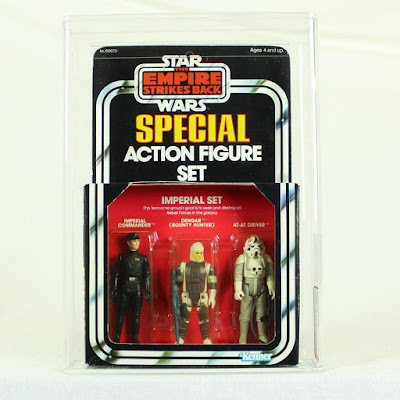 In the world of Vintage Star Wars no other segment has seen as quick and as consistent an increase in prices as the Star Wars and Empire Strikes Back window box 3 Pack Sets. Theses sets have always been some of the most sought after production pieces in the Vintage line. With the situation we’re seeing over the past year, these have become truly expensive on a whole new level. Whereas one could buy a Creatures Set or Droids Set in the last few years for around $1,500, the sets are going for nearly $5K today. Thus it shouldn’t have surprised anyone to see Brian’s Toys sell an ESB Imperial Set on Cyber Monday for over $9,000. With a strong grade and being a mid-tiered piece in terms of rarity to the rest of the line, the ending price was in line with what one should expect to pay today. Whereas a few years ago you could put the run together for $80-$100K, some sets in today’s market on the rare side of the scale sell for upwards $30,000 on their own (for high grade examples). That’s it for this edition of the MarketWatch, thanks for another great year! We’ll be back in February with our post-Holiday round up of the market. 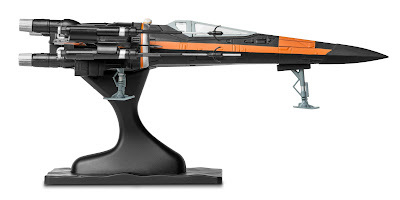 If you haven't realized by now, I'm a sucker for seasonal Star Wars items. This especially applies to Christmas items. I thought I'd share some of the most awesome seasonal Star Wars items the galaxy has to offer us this year. Worry no longer! Christmas In The Stars, the definitive (and thankfully only) Star Wars Christmas album is finally in print again. It was re-released by Amazon just in time for the holiday. This version is meant to emulate the origional LP recording and includes a 'record sleeve' for your CD with the origional RSO label design. 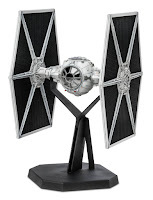 Wandering around the stores this year, Hallmark had a few new offerings beyond the annual holiday ornaments. This year Itty Bittys came with holiday garb. 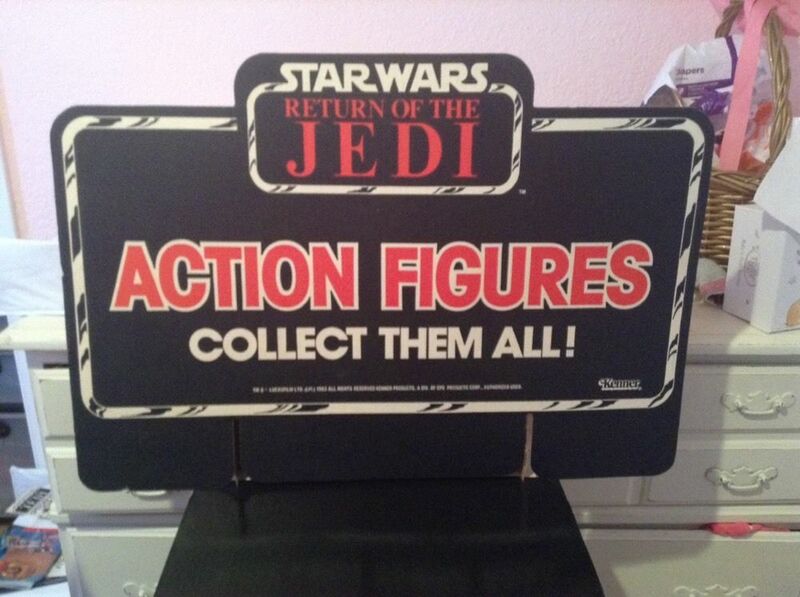 Available were fan favorites Chewbacca, Yoda, R2D2, and C3PO. As an added bonus, proceeds benefit Toys For Tots. Santa Yoda offerings this year included a mini stocking from Target and a bizarre 'didn't know I needed it but so happy they made it' mini lunchbox gift card holder. It has the added surprise of Yoda telling your fortune! Finally, I did add this lovely vintage find, a Chewbacca Christmas card by Drawing Board. The inscription is the best part! 'Till next year, Santa Ewok and I wish you Happy Holidays and a Star Wars filled New Year! 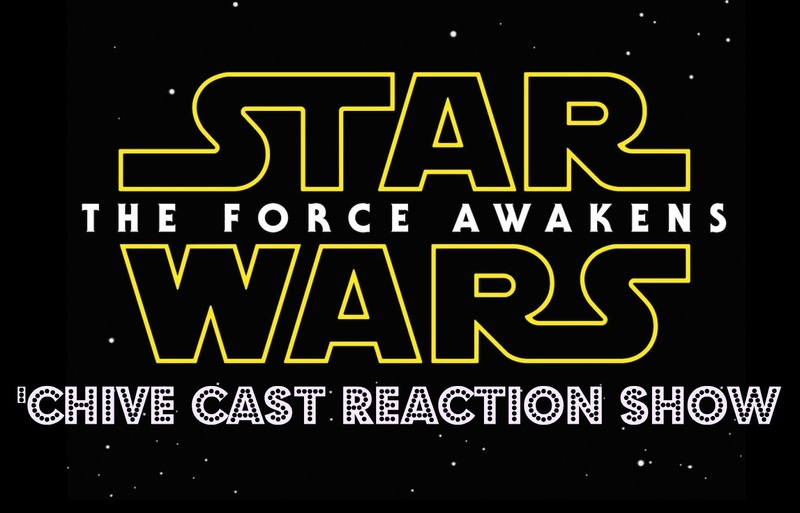 It’s a Force Awakens Response Podcast, from a Vintage point of view. Skye and Steve talk about their thoughts and reactions and break down the 10 biggest winners and losers among Vintage Star Wars items. It’s another unusual podcast, but its not like these movies come out every month! Caution. Henceforth, there will nothing but spoilers! Who wins? Who loses? Listen to the newest ‘Chive Cast Vintage Pod to find out. Revell models has had a busy week. Having already revealed their new Master Series of models, they also sent us pictures of their next assortment of models: SnapTite Max. These are more complicated than their first series of SnapTite models and are aimed at a slightly more experienced model builder. We really like this line. It's a nice compromise between the ease of assembly found on the first series of SnapTite models, but with more detail. 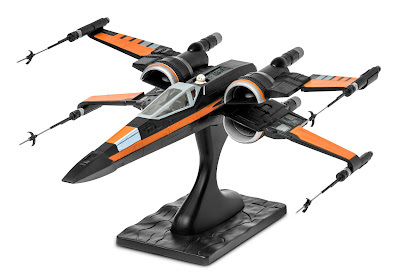 Additionally, it doesn't require the time or expense of the Master Series of models. 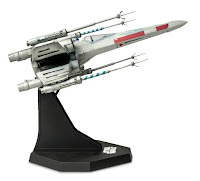 The five new SnapTite® Max™ models replicating the vehicles in Episode VII of Star Wars enable builders ages 8+ to construct detailed, real-world renditions of the Millennium Falcon™, Poe’s X-Wing Fighter™, Resistance X-Wing Fighter™, First Order Special Forces Tie Fighter™ and Kylo Ren’s Command Shuttle™ from the new movie. Each Skill Level 2 kit features 39 to 85 pre-decorated, snap-together pieces that can be assembled in an hour with no need for paint or glue while providing a more challenging project as compared to the SnapTite Build & Play line. The finished SnapTite Max models are significantly larger and more detailed than the SnapTite® Build & Play™ kits designed for younger children, thanks to higher piece counts that allow more details to be molded into the plastic. 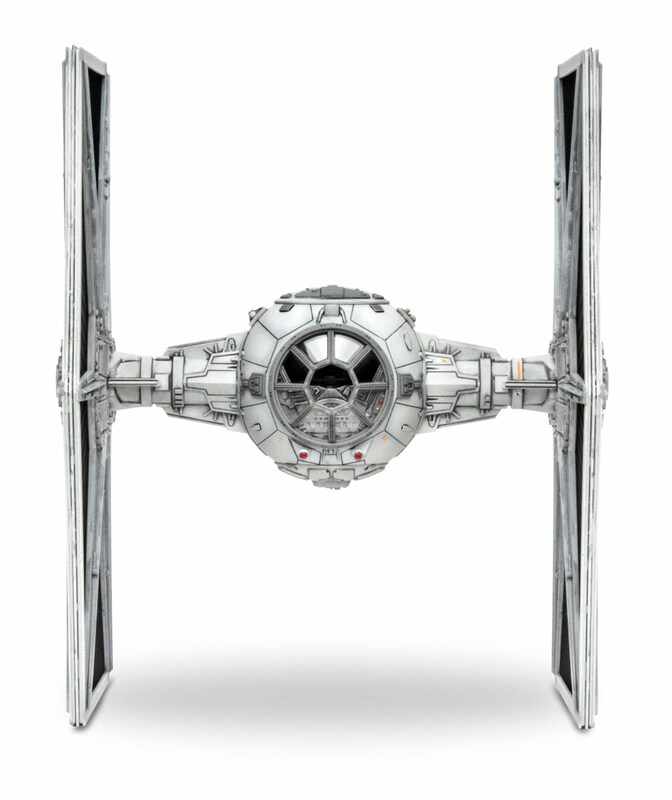 Assembled sizes range from 10” x 8.8” for the X-Wing Fighters to 14” x 10” for the Millennium Falcon™. 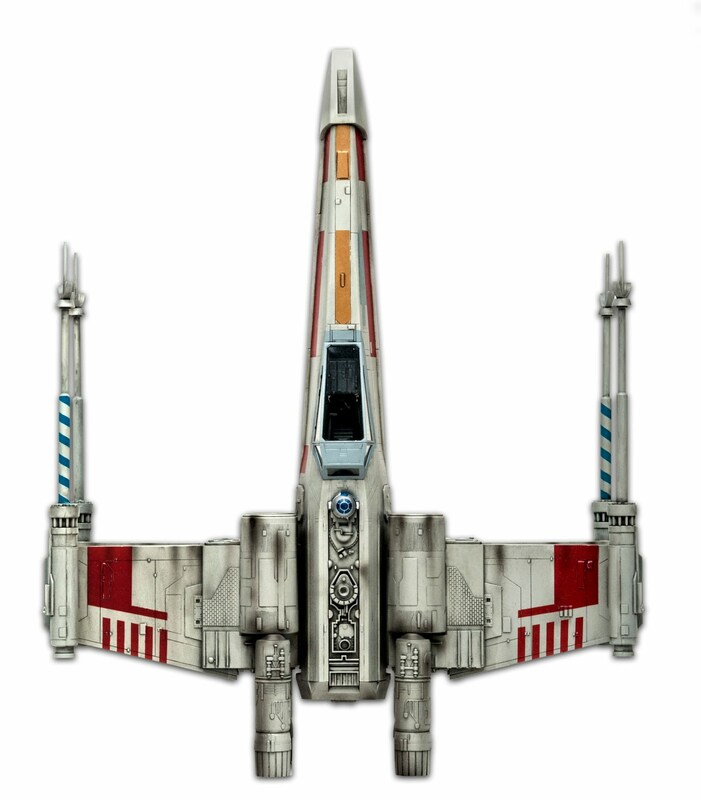 All five also have moving parts like open/close cockpit hatches, removable landing gear and wings that open into attack mode – to better replicate the epic battles taking place in a galaxy far, far away. The new SnapTite Max kits are available at Hobby Lobby stores and online. Prices range from $29.99 to $69.99. Regardless of what you think of The Force Awakens, I think we can all agree on one thing: it won't be in theaters a year from now. Within a few months you'll be watching it on your flat screen while eating C-3PO popcorn and saying something like, "Maybe I wasted my money seeing it in the theater 600 times." But back in 1977 Star Wars played in some theaters for a full year, all the while racking up box office returns and padding the profits of the Kenner toy company. 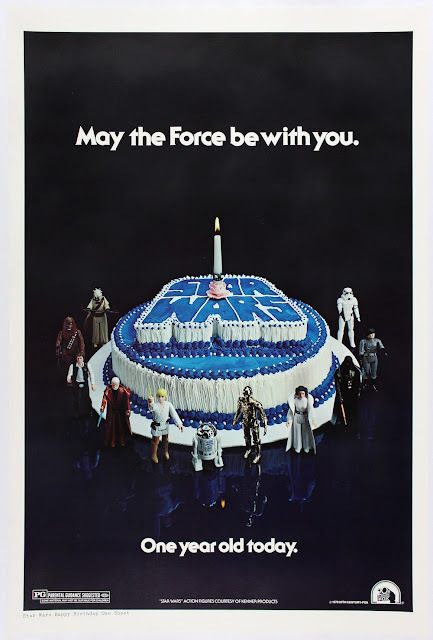 So important were the toys within the Star Wars ecosystem that the theatrical poster issued to celebrate the one-year anniversary of the movie's release featured Kenner action figures front and center. As far as I know, this is the only time a movie poster has functioned as a de facto toy advertisement. The poster was printed by Gore Graphics, the company that printed a lot of the posters created for movie studios and the National Screen Service during the '70s and '80s. Once the theater employees were in possession of the slicks, they would clip out the appropriate graphic, modify it with text showing theater name, location, and show times, and purchase space for it in the local paper. Because papers priced ads according to the number of columns (width) and lines (height) they would occupy, the slicks are proportioned in different ways. The largest, comprising six full columns and 1200 lines, is equivalent to a full-page ad. As you can probably tell, the graphic used on the slick is not an exact reproduction of the image on the poster. 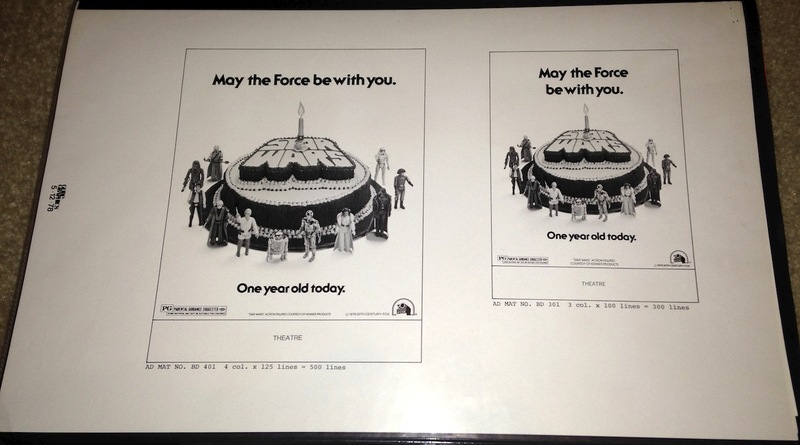 The background of the slick is white rather than black, and the colors of the cake differ between the two images. There are several additional, more subtle differences. My guess is that the image on the slick was created via a combination of photo montage and airbrushing. In other words, it's not a photograph, but rather something assembled by an art department in a manner that ensured it would display well in small, black-and-white reproductions. Collectors often comment on the absence of the Jawa figure on the poster: Of the first 12 figures issued by Kenner, the Jawa is the only one not represented. 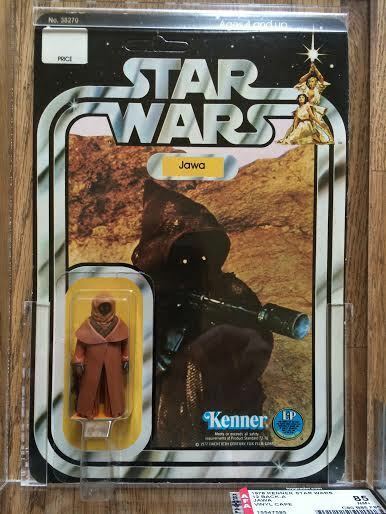 While it's tempting to ascribe this absence to the change from a vinyl to a cloth cape that notoriously affected the Jawa, I think it's more likely that the figure's scale and dark coloration simply didn't lend themselves to a balanced composition. Four-column, three-column, and two-column ads. 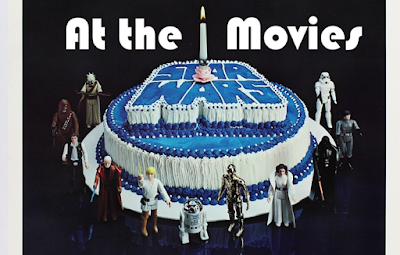 Clearly, the designers of the poster reserved the space at the front of the cake for the two droids, Luke, and Leia. 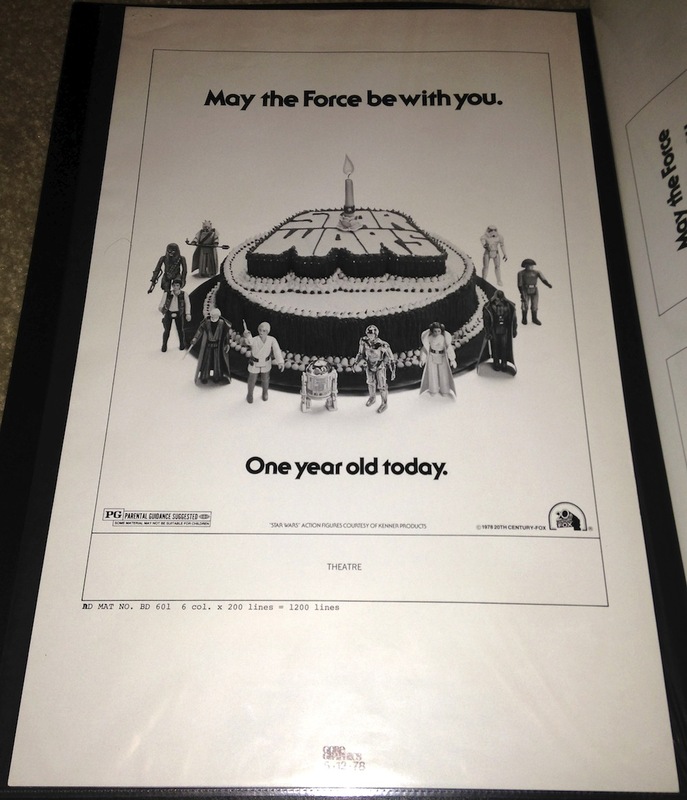 The natural space for the Jawa was opposite the Sandperson on the right side of the cake, a distant position that would have rendered it little more than a dark blob on the poster. Of course, it's also possible the Jawa simply called out sick on the day the photo was taken. 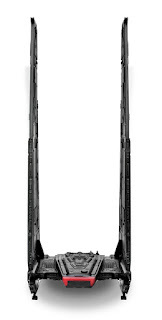 Above you see an example of an actual newspaper ad created using these slicks. I believe it derives from one of the four-column examples, though the image has been downscaled a bit, and the arrangement of some of the textual elements appears to have been tweaked. The ad is for a theater located at the Oakbrook Shopping Center in Illinois. 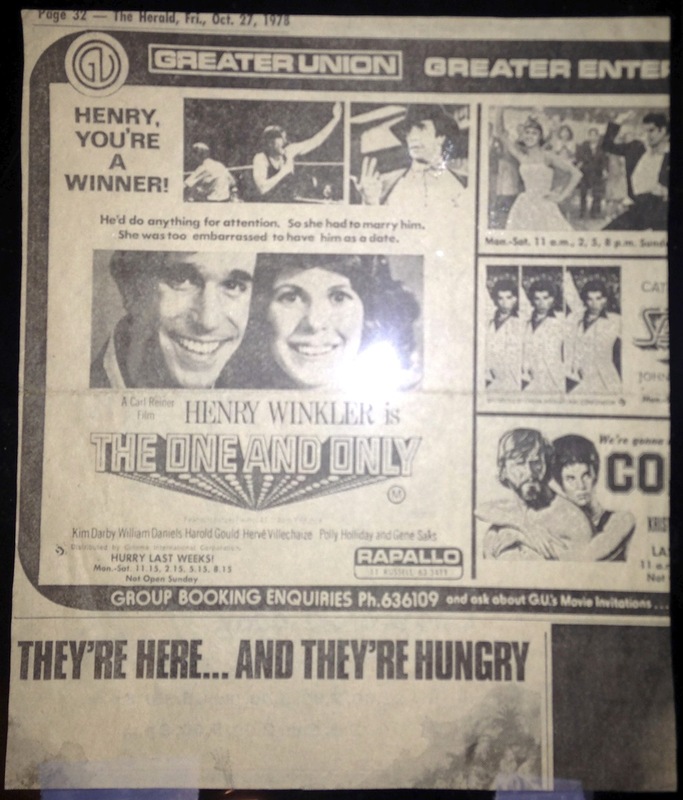 As is evident from the date written on the ad, it ran in the paper on May 26, 1978. 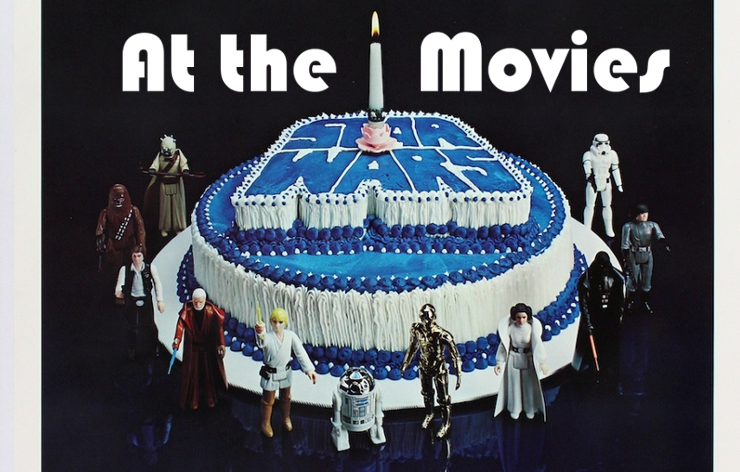 Star Wars debuted in theaters on May 25, 1977. Here's the reverse of the ad, which almost succeeds in persuading me that it derives from an alternate universe. What is this strange film featuring what I can only assume are the Bad News Tigers? 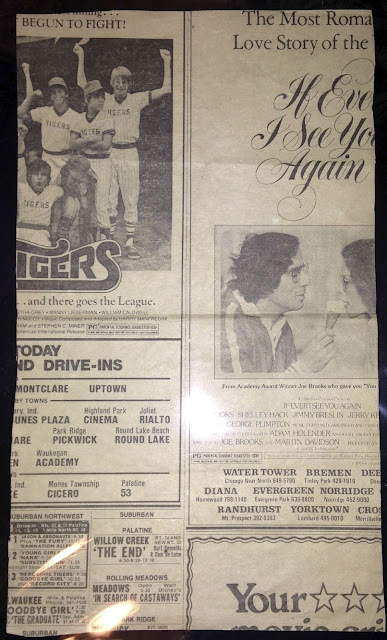 And though I know a fair bit about movies, I've never heard of If Ever I See You Again, which apparently utilized the talents of George Plimpton and featured an erotically charged ice cream cone. Fortunately, the smaller movie notices mention Brian De Palma's The Fury and a revival of Jason and the Argonauts. We're in the correct universe. Phew. In "The Star Wars Poster Book," which should occupy a spot in the library of every serious collector, Steve Sansweet and Pete Vilmur explain that the "birthday" poster was "distributed to theaters still showing the film a year after its opening." It's never been clear to me if the "year" in this sentence was calculated from the day on which the specific theater began showing the movie, or from the date on which Star Wars opened in any theater. The theater in the Oakbrook Shopping Center is not on this list of approximately 40 venues that showed Star Wars on that Memorial Day weekend in 1977. However, several other Chicago-area theaters are on the list, and the Oakbrook location does appear to have been outfitted to show 70mm films with Dolby stereophonic sound, which was a prerequisite for screening Star Wars on its opening weekend. 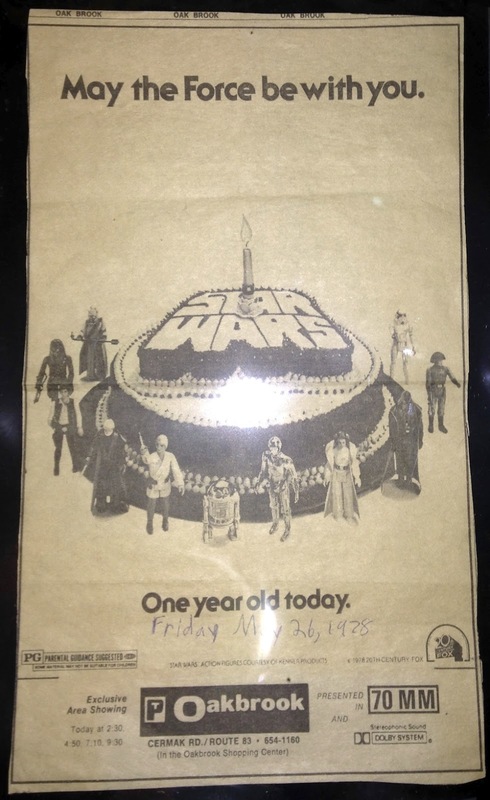 If anyone knows if Star Wars played at this location between May 25 and 27, 1977, please let us know in the comments. 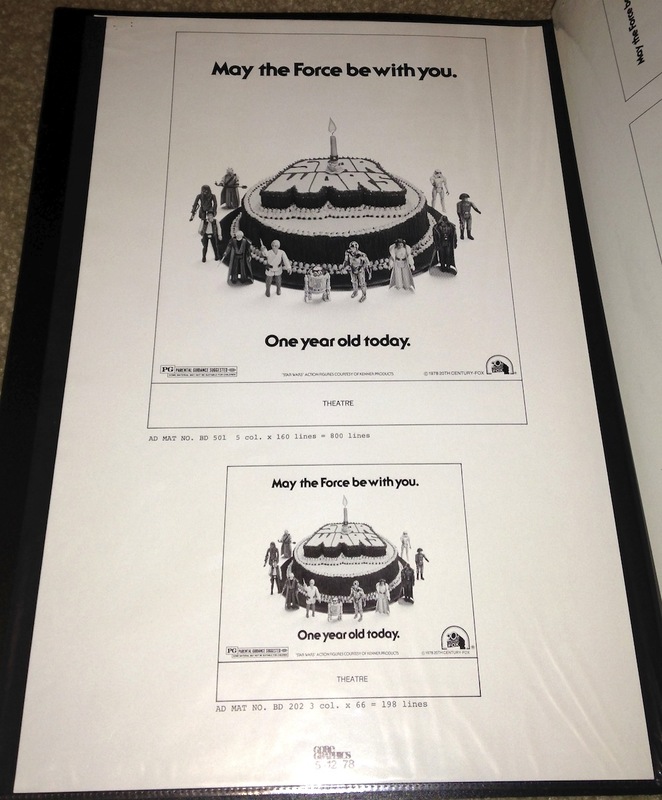 Here's another example of a "one year old today" ad from an old newspaper. 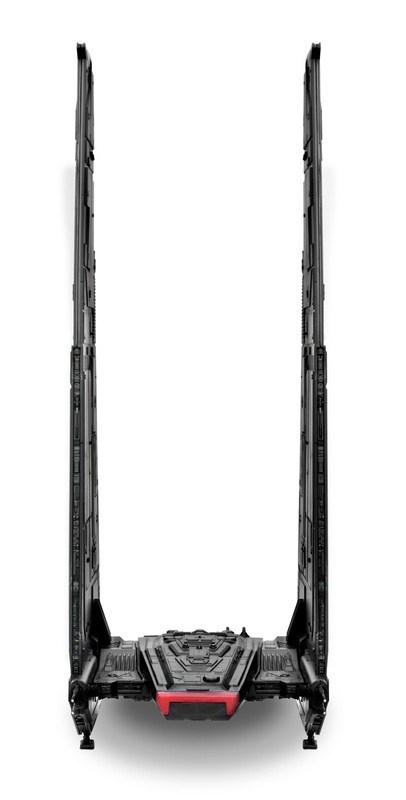 This one was modified heavily from the above slicks; you can even see lines surrounding the main image, indicating that it derives from a mock-up created from elements that were clipped and repositioned. Also, the print quality is quite poor, suggesting it is not a first-generation reproduction. He'd do anything for attention. So she had to marry him. She was too embarrassed to have him as a date. Read it a few times. Tell me those aren't the weirdest three sentences your brain has ever tried to process. She married him to avoid the embarrassment of dating him? Okay, having gotten that out of the way, we can discuss the date. No, not Winkler's embarrassment date, the release date of the movie. The top of the page reveals that the ad appeared in the paper on October 27, 1978. "Ah," you're saying to yourself, "this theater must have gotten the movie late!" You see the Hoyts Cinema Centre at 140 Bourke Street wasn't a U.S. theater; it was an Australian theater, located in Melbourne. And Australians didn't get to see Star Wars until it had been out in the States for several months. Sure enough, IMDb reveals that Star Wars hit Australia on October 27, 1977, exactly one year prior to the date of our ad. The Cinema Centre was a luxurious movie palace designed with a modernist aesthetic. You can read more about the complex here and here, and you can peruse some of architect Peter Muller's original drawings and models here. More pertinent to the present topic is the comment of "Snub" in the discussion about the Cinema Centre found here. In it he says, "My favourite memory of the place, along with thousands of others, is the initial engagement of Star Wars that ran for over a year in the building." 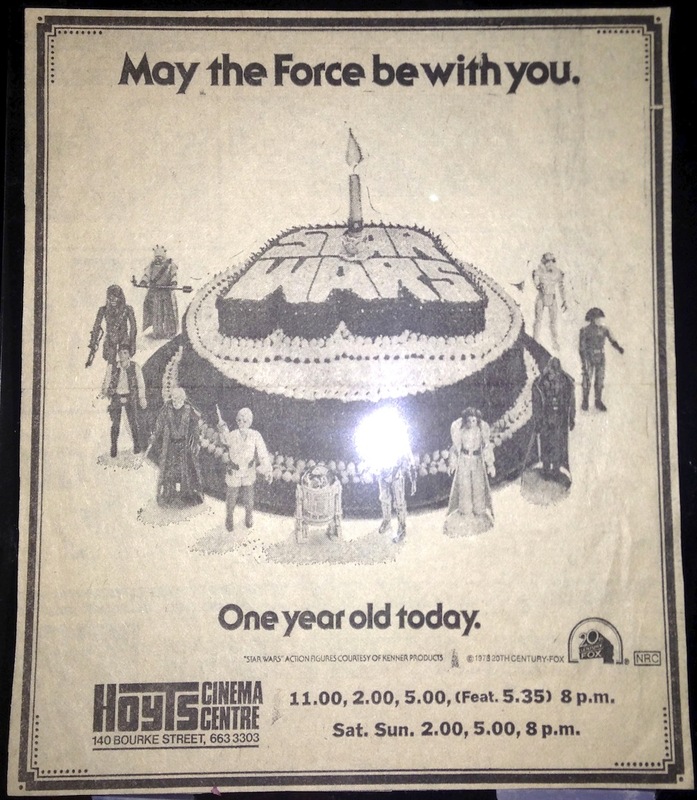 There you have it: Firsthand confirmation that Star Wars played in the Cinema Centre for a full year. Sadly, the Cinema Centre is no more, having been boarded up in the '00s. 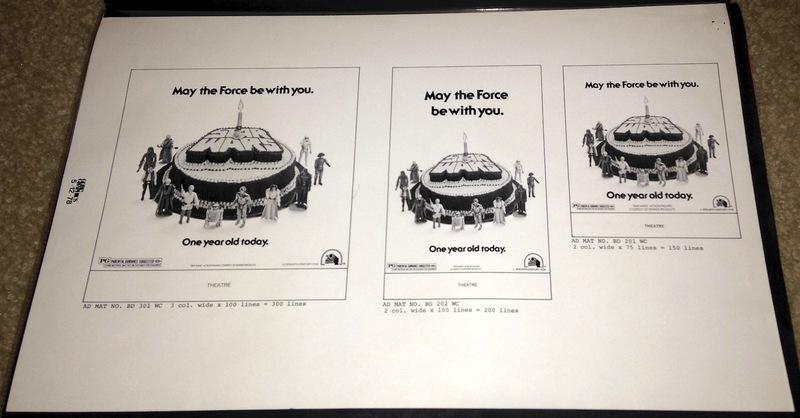 One question remains: Was the "birthday" poster ever used in Australia? I would guess not, but I'd love to be proven wrong. 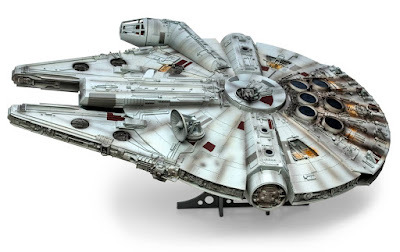 As if Star Wars fans didn't have enough excitement this weekend, Revell, long-time friend of the SWCA Blog, has given us the go ahead to share this exclusive first look at their new Master Series product line! 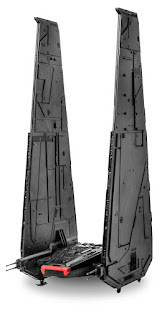 As you may recall from our article on Revell's original announcement of their new Star Wars lines, they promised that they'd soon have models with an even more extreme level of detail than their popular Snap Tite models, which are already detailed beautifully. We got a lot of feedback from collectors and fans about that article, much of which concerned questions about the Master Series line, but we weren't able to provide any real details on it until now. 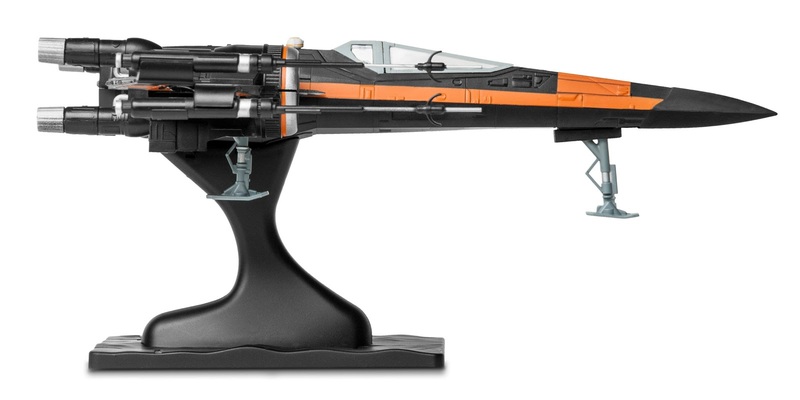 The Master Series is designed for model Jedi Masters, who want to create something which honestly looks like it could be a prop model from ILM or a screen-grab from the film that's photoshopped onto a plastic base. They're awesome! Take a look! From a collecting standpoint, I'm excited to see these! 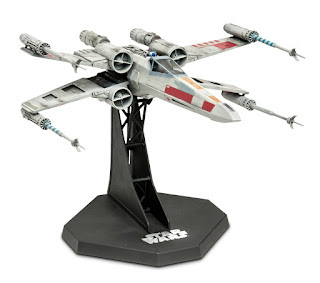 I really enjoyed the Snap Tite models, but it's nice to see Revell balancing their offerings by creating something for the more experienced modeler. I'm not an experienced modeler by any means, but it's still awesome to see! 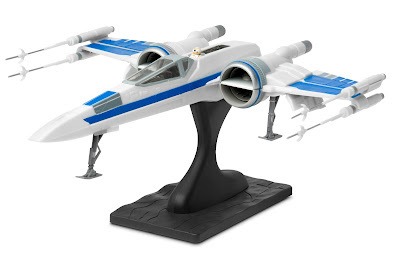 There's a TON of different Star Wars products hitting the shelves lately and it's easy to overlook stuff. But I think of all the licensees creating merchandise for the new films, Revell is the one doing it the best. 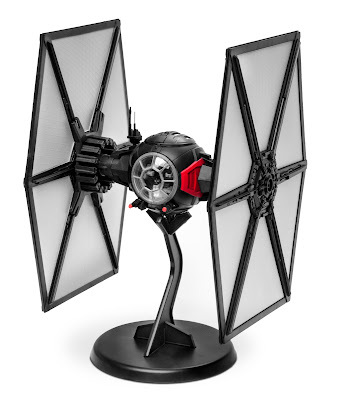 They're releasing cool, fan-centered products with an old school feel. They're nice to collectors, listen to their feedback, and have something for every age and skill set. I have a lot of respect for that. Can't wait to see what else they have planned! The Master Series™ Fine Molds™ advanced scale model kits featuring the iconic Star Wars Millennium Falcon™, X-wing Fighter™ and TIE Fighter ™ vehicles. 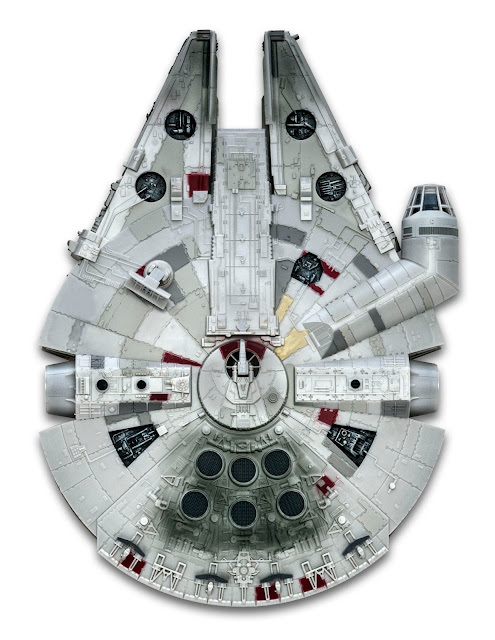 The 1:48 and 1:72 scale, paint and glue kits feature piece counts up to 900, finished sizes up to 17-1/2” long x 12” wide, revised and color enhanced waterslide decals and a level of detail that might convince even Han Solo that he is going into battle in the real thing. The Millennium Falcon is available at www.revell.com and in hobby stores immediately. 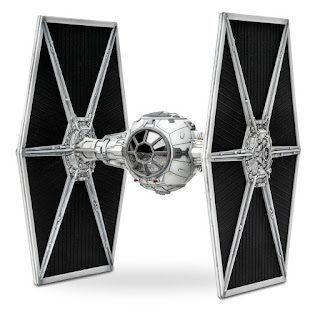 The TIE Fighter and X-wing Fighter will be available from the same sources in December for pre-holiday purchase. 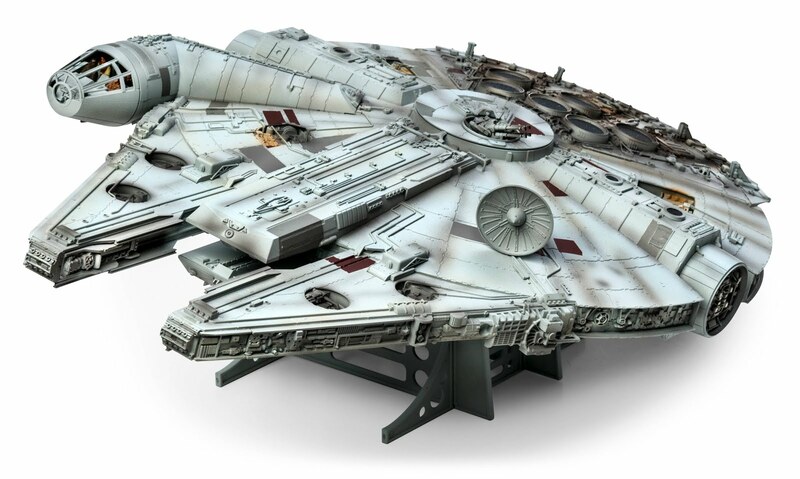 The three Master Series kits are the latest in a series of Star Wars vehicle model kits that have been released by Revell since September as a prelude to the December 18 premiere of “Star Wars: The Force Awakens” in movie theaters. 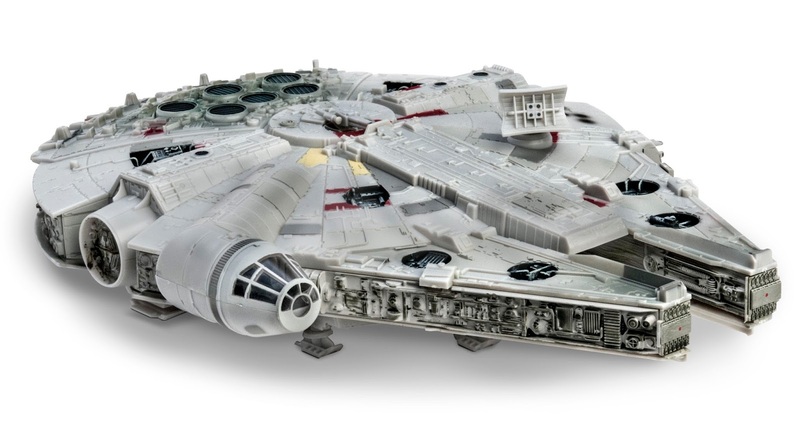 The other nine kits are pre-decorated, snap-together models for beginner and intermediate builders. The series includes four SnapTite Build & Play model kits for ages 6+ and five SnapTite® Max™ models for ages 8+ featuring 39 to 85 pieces each. It’s a patchwork ‘Chive Cast this month without the usual features but with tons of information. First, Skye talks with Conall Jones, the producer / director of the new documentary series on Star Wars fans “In a Galaxy” and one of its stars -- the master of Vader, Bill McBride. Then we decide to rebroadcast the ever so timely, yet evergreen interview with Rick Springfield (Skip ahead to 1:25 if you are a super Rick Fan). Finally, we talk with James Gallo about his job as a “Consultant” on the recent Sotheby’s auction of Star Wars memorabilia that raked in more than $500,000. So, hunker down with a quilty 67th podcast. We have what I hope is a special treat for our readers this Christmas: a tell-all column from Mookiee the Ewok. Mookiee has had a rough go of things these last few years. Maybe you saw that story in the Enquirer. But when all is said and done, he's had some great experiences, and he's definitely played a part, however small, and however fuzzy, in the behind-the-scenes story of Star Wars. I have to warn you: Mookiee is a salty and unpredictable character. I've done what I can to clean up his language. Also, we can't vouch for the veracity of any of Mookiee's claims. Mookiee is a notorious confabulator. And let's face it: There have been times in his life when he wasn't exactly sober. For what it's worth, I believe Wilford Brimley to be a very nice man. With that in mind, have a great holiday season. And keep Mookiee in your thoughts. Seems like he needs it. 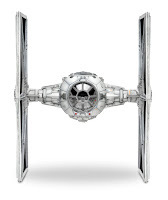 As I follow the news related to the imminent release of The Force Awakens, one thing bothers me. Specifically, there aren't enough g*d**n Ewoks. Yeah, I know exactly what you're thinking: "Mookiee's been hitting the bottle again." Well, of course I've been hitting the bottle again. It's the holidays, it's been 30 years since I've had a paying gig, and chicks dig "woklings" about as much as they dig "action figure collectors." The last woman I approached told me I could text her sometime. Then she said, "Aww, I forgot -- you don't have fingers." Fingers or no fingers, you have to admit that we Ewoks have had it hard since the '80s. First there was that TV movie featuring Wilford Brimley. Don't get me wrong, working with "Oatmeal" was a dream come true. I mean, who wouldn't jump at the chance to act beside a man who thinks "hygiene" is the title of a Greek play no one reads anymore? Grooming habits aside, Brimley was an adventure. If he wasn't trying to get Princess Kneesaa to sit on his lap, he was sticking two cigars under his top lip, crawling around the set on all fours, and bellowing, "Look at me, I'm a space walrus!" We had to shoot some scenes a dozen times because Wilford couldn't remember what an Ewok was. He thought we were gnomes sent from the future to warn him about an enlarged prostate. Every time the director called "action," he'd bend over and wince. Oh, you haven't watched it either? Well, maybe you were doing something more amusing, like staring at the ceiling in a semi-vegetative state, or eating Grey Poupon straight from the jar while sitting in Logray's kitchen in your underpants and yelling, "Are you not entertained?!" at the top of your lungs. Not that I've done either of those things more than a couple of times. According to Hollywood rumor, after "The Star Wars Holiday Special" failed to live up to expectations, George Lucas bet Steven Spielberg that his next TV project would be a masterpiece. When Spielberg came to collect his winnings, he said, "That Ewoks cartoon was terrible, George. What happened?" To which Lucas replied, "Joke's on you, Steve. I have too much money to care about losing bets or making masterpieces. Have you heard about my new movie? It stars a duck, and he plays guitar." Seriously, Ewoks was so bad that two-thirds of the action figures in the associated toy line weren't even Ewoks. They were these green things that looked like the Grinch from How the Grinch Stole Christmas. By the way, do you know who stole my Christmas? Vodka stole my Christmas. When the prequels rolled around, we all thought George would throw us a bone or two. While watching them I saw Tusken Raiders. I saw Jawas. That a**hole Ree Yees was even in a scene or two. But not a single g*d**n Ewok. When I asked George about this, he said, "Well, you know, the Ewoks are industrious, self-sufficient beings, and they keep to themselves in the forests." Oh, I see: We're like the Unabomber. Or the Palins. Mookiee: Jawas are great, George, especially if you don't have to live next to them. But shouldn't you show some love for the guys who were the decisive factor in the battle in Return of the Jedi -- the ones who went to bat for the Rebels in their time of direst need? Mookiee: I have no idea what you're talking about. George: Nien Nunb is a Sullustan. You can look it up on Wookieepedia. Mookiee: Oh, suuure! Praise Nien Nunb, the Jar Jar of the '80s, and ignore the heroes whom audiences everywhere saw freeing the galaxy from tyranny and oppression. George: Well, that's not what I saw. And who are people going to believe, the guy who created Star Wars, or the guy who got drunk at a Lucasfilm Christmas party and told everyone he was the inspiration for Survivor's "Eye of the Tiger"? Mookiee: I stand by that story. George: And I stand by Rick McCallum. Doesn't make it right. Mookiee: George, I remember the movie. There are hang-gliders made from rawhide, logs bashing the heads of scout walkers, and Ewoks playing drums on stormtrooper helmets. There's even a song -- a song sung in the language of my people! George: Oh, we deleted the song in '97. Maybe you didn't see that version. I think it came out while you were <<makes air quotes with fingers>> vacationing in Thailand with John Travolta. Mookiee: You know what the "B" in "Nunb" stands for? Mookiee: "Bourbon." Make it a double. Well, there's no need to prolong this. It's nearly Christmas, and the doctor says I need to clear my house of sharp objects before Uncle Gundy gets here for our annual "alone on the holidays" party. No, I'm not going to make him dress like Santa this year. And no, I'm not going to hold him hostage with a pair of scissors until he tells me I've been a good boy. I'm sure I'll see the new movie along with the rest of you mindless zombies. Maybe J.J. will surprise me, and when Captain Phasma takes off his helmet, it'll be my man Teebo under there. Thanks to Jarrod Clark for trekking to Mookiee's wood-paneled compound to get a photo of our author in his native state. 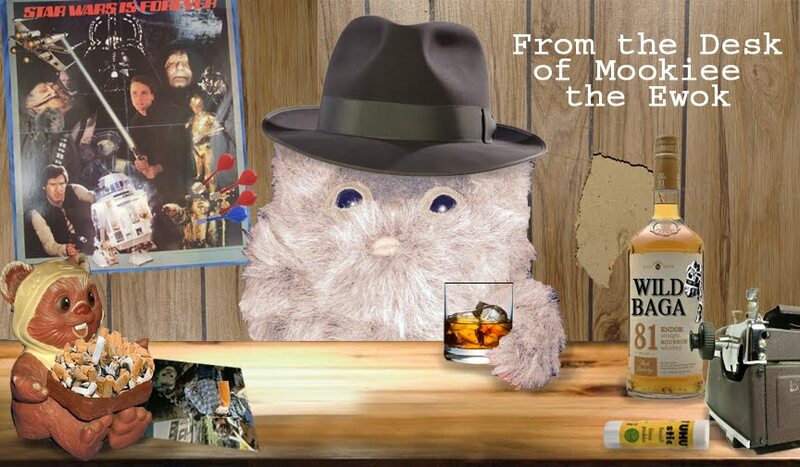 And thanks to Tom Quinn for suggesting that we track Mookiee down in order to get his take on the lack of g*d**n Ewoks. As to Mookiee's claims about Nien Nunb, I'd say this serves as at least a partial confirmation. 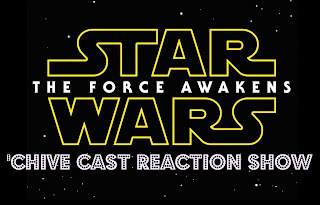 Here we are...opening week of a new Star Wars film. 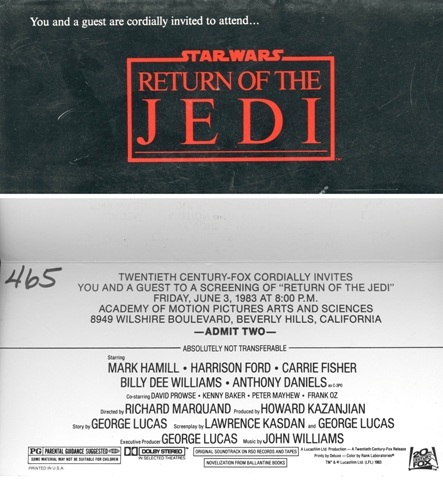 With fans and the rest of the globe reaching a fever pitch for Episode VII, I'm more interested (or perhaps desperate for a distraction) in taking a look at the hottest ticket of the late 70s and early 80s -- a preview screening of Star Wars or one of its two highly anticipated sequels. With advanced screenings for the press kept to a bare minimum for The Force Awakens to maintain its doctrine of secrecy, it's interesting to step back to a time before the original films had been unleashed upon the world. Advanced screenings for major motion pictures are a critical marketing component to appease studio executives and other investors, gauge potential audiences, and ultimately generate buzz among the press and members of award-voting institutions (or suppress it, if all signs point to a flop). Tickets and invitations from such preview screenings represent another ephemeral collecting avenue for the historians in us, and there are several examples here on the Archive worth highlighting. 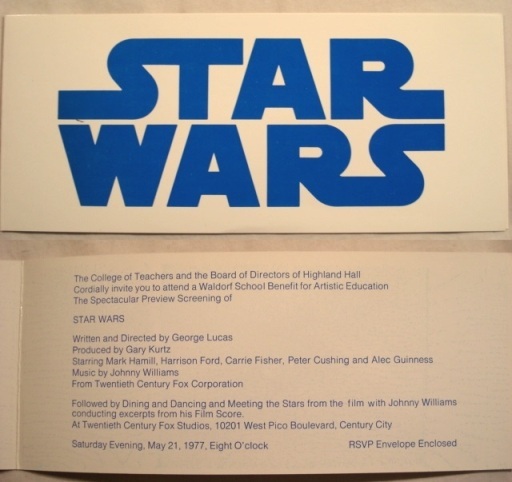 The following invitation/ticket to a "Spectacular Preview Screening" of Star Wars held at the 20th Century-Fox lot several days before the film's opening was held to benefit the Highland Hall Waldorf School in Northridge, CA. With dinner, dancing, cast meet and greets, and live excerpts from the score conducted by "Johnny" Williams, it sounds like a pretty fun evening. Two days later, 20th Century-Fox held "one of the most spectacular [there's that word again] previews of all times," likely at the Academy of Motion Picture Arts and Sciences ("m.p.a." probably short for "Motion Picture Academy"). For those poor blokes in the United Kingdom that had to wait until December to feast their eyes on Star Wars in their local cinemas, some had a chance to attend sneak previews that summer and fall at the Dominion Theatre in London. Preview screenings for The Empire Strikes Back were taking place several weeks before its official world premiere at the Kennedy Center in Washington, D.C. on May 17th, 1980. 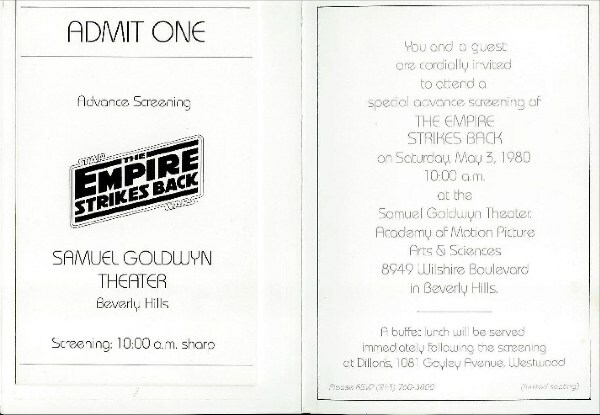 Empire also had several charity benefit premieres on May 19th and 20th before its May 21st general release. One of which was a benefit screening on May 20th for the Crossroads School in Los Angeles at the former Avco Center Cinema on Wilshire Blvd. 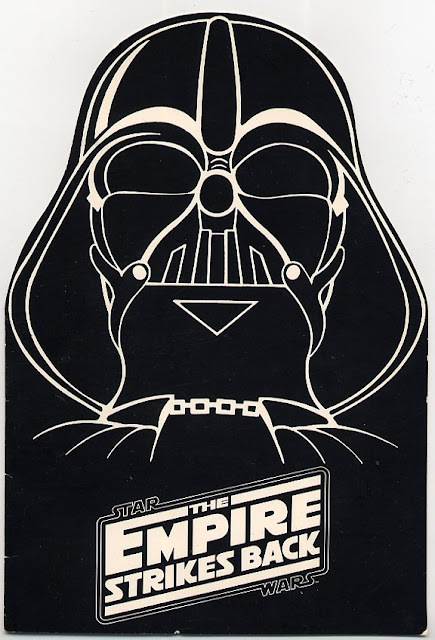 The Darth Vader graphic used for this fantastic die-cut invitation was also used on a promotional portfolio sent exclusively to theater owners. Benefit preview screenings were held for Return of the Jedi as well. 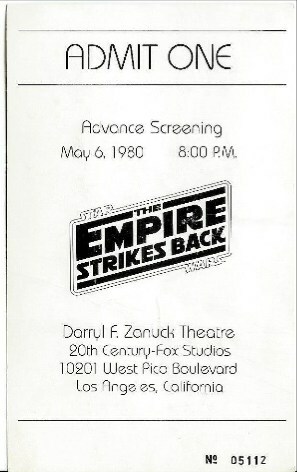 The following invitation is from a screening in Overland Park, Kansas the evening before the film's wide release on May 25th, 1983. Though this particular example for a June 3rd private screening at the Academy is technically not an advanced screening, it's printed on a basic ticket template that was used for the film's press screenings.